Chorus and Orchestra of Maggio Musicale Fiorentino/Arthur Rodzinsky. 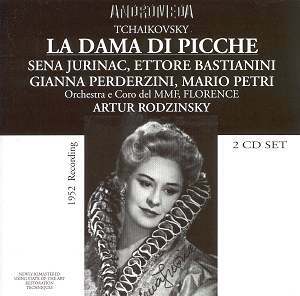 On the surface, this is a very tempting set of a major Tchaikovsky opera, what with Jurinac and Bastianini in the cast and Rodzinsky in the pit.� The first thing to notice is the language � this is live, Italy, early fifties, so it is sung in Italian. The mismatch between the Italian language - with all its bel canto associations - and the rather more down-to-earth slavic feel of the original is marked. If you are only just getting to know Queen of Spades, this is not the place to start! There�s more. The sound distorts, sometimes slightly, sometimes terribly. At lower levels there is a loss of definition to the orchestral contribution - a shame, given who is in charge there. There are problems of ensemble, also, between children�s chorus and orchestra and at times between singers and orchestra (try around two minutes into CD 2). Mostly, one misses a Russian-sounding orchestra. The first time the strings really dig in is not until track 11 of CD1, where they begin to approach any sort of darkness of tone. The two biggest names here are of course Jurinac and Bastianini. Jurinac appears here only two years after her Glyndebourne debut. Her scene with Rina Corsi�s Paolina is a delight, if one can ignore the dry accompaniment and the distortion! Actually Corsi seems to match Jurinac throughout. Yet it is at the close of the opera that Jurinac triumphs and one can hear her star quality clearly. The Herman - Ermanno here, of course! - is David Poleri. He emerges as very dramatic and strong. In fact the male singers are generally very good. Silvio Majonica is a sure-voiced Surin, while Bastianini has plenty of confidence. If only Bastianini sounded that bit more Russian! Despite the presence of Jurinac and Bastianini, for me the star is the Countess, Gianna Pederzini, who shades her part exquisitely, has a strong lower register and can be truly gripping (Act 3). Rodzinsky conducts with a sure sense of drama throughout. It is difficult to tell where the fault lies in the various lapses of ensemble, though. The Rodzinsky discography deserves and needs expanding, but in reality this release does the conductor few favours due to the sound quality. This performance has been available on LP: 3 LP-box on Cetra, DOC63.� I can only imagine that it sounded better there!